If you’ve noticed on most food posts on this blog, I am thrilled when a restaurant or eatery offers soup. I’m really fascinated with soups especially those that are beef broth-based. 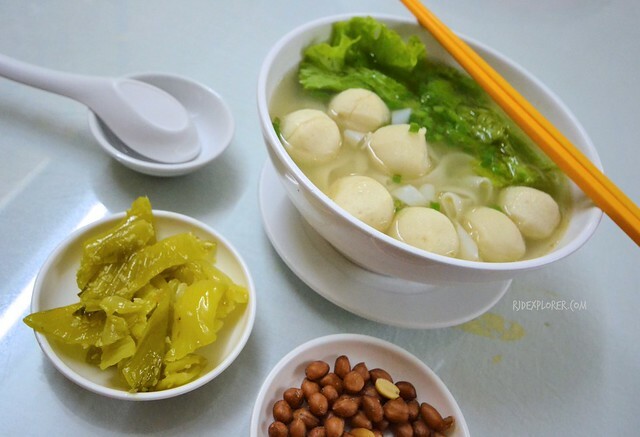 When I planned to visit Ho Chi Min City, Vietnam, I was so excited because the city, and country in general, is famous for hefty bowls of noodle soups. Looking for suggestions for a Saigon food trip? Check the items listed below. Piping hot bowls of soup especially when garnished with herbs and spices really excite me. Probably because I grew up in a family who loves to spend weekend afternoons sharing bowls of soups. Streets of Saigon became my haven every time I passed by a local vendor preparing a magical bowl of pho. How can you say no to a considerable bowl of soup that only costs around a dollar (Php50). Trip from KLIA2 to Tan Son Nat Airport starved me and I availed my first meal from a Chinese restaurant. Fish ball noodle soup was the first item on the menu that caught my eyes. I had no other choice so I ordered one. The lady served peanuts and pickles which I thought were free sides for the soup. Later on, it cost me an additional 5,000VND. The broth flooded the flat rice noodles that is topped with some green leafy veggies. Seven fish balls float as I watched the crew put the fuming bowl in front of me. Despite of the hidden charges of the sides, the soup was good and not a bad first meal in Vietnam. XO Tours curated an epicurean feast for participants of their Foodie Tour. The first meal on the night food tour is a bowl of Bun Bo Hue. 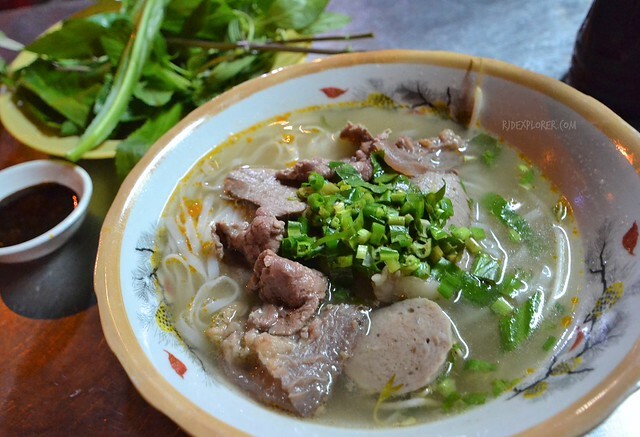 The soup name has a literal translation of ‘beef noodles from Hue’, with Hue a province in central Vietnam. After swirling the vibrant streets of Saigon, my guide parked the motorbike in front of a noodle house. Tour participants began to fill the chairs while tour crew started to serve a fancy bowl of Bun Bo Hue. 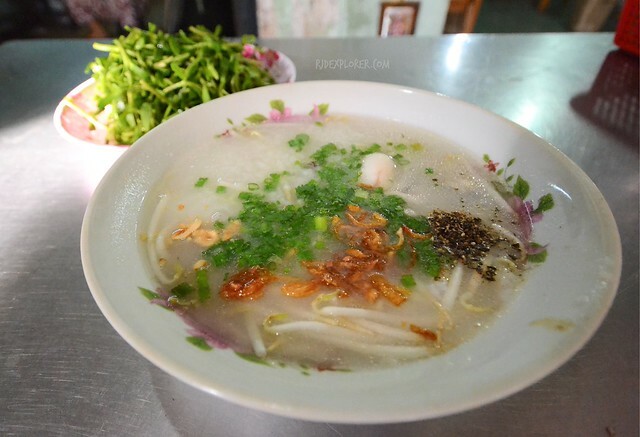 Everyone will definitely be enticed to dig in because of the inviting aroma of lemon grass on the soup. It was served with sides like beansprouts, scallions, and banana blossoms. You have the option to boost the sharpness of the soup by adding dash of powdered red chili. Meat toppings were tender and really locks the flavors from the broth, veggies, and spices. Availing a bowl of Chao Ga coming from a draining Cu Chi Tunnel experience was really a challenge. The local vendor didn’t know how to speak English and there was no one to help us. It took me more than 2 minutes waving my hands in the air and pointing the meal on her booth. Luckily, a man was busy eating a bowl of Chao Ga that became my reference in availing the same soup. Chao Ga is a rice porridge consumed by Vietnamese folks to warm their bellies on a cold day or cure some nasty hangover. It’s similar to a congee but the generous use veggies like beansprouts and scallions is more evident. The soup commonly requires chicken yet the one I availed had fish fillets. The bowl was served with a green leafy vegetables I wasn’t able to distinguish. Who can ever leave Vietnam without trying the famous pho? No one. The soup is already essential that there’s no way you can avoid it on one of your visits. Spotting side-street food stalls automatically earns you a high-stake in guessing what it offers, pho! With the magical ensemble of spices, broth, toppings, and veggies, there’s a greater chance that you won’t identify the ingredients. My advice, don’t mind the technicalities and enjoy the hot bowl of soup. If you’re persistent to discover the intricate components of the famous soup, you can watch the vendors assemble your bowl. While doing this, you can also interact with them to know the ingredients. Basic spices include cinnamon sticks, star anise, cloves, fennel, coriander, and cardamom. What’s behind the fragrant and savory beef soup, it’s a secret for them. Noodles also play an important role on the composition. After I settled my payment for my pho, slurping sounds echoed combating the noisy beeps from the passing vehicles. In just 5 minutes, I emptied the bowl. A friend, an avid Anthony Bourdain fan, recommended visiting the Saigon Lunch Lady. 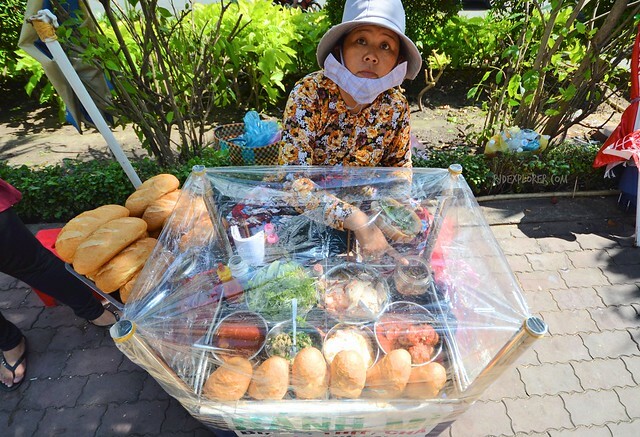 Her stall is in Dao Ka and it’s a bit far from the city center. I spent almost 15 minutes walking under the scorching Saigon heat because I had no idea what bus to utilize. When I arrived at the place, a sign on a tree signaled me that I was on the right place. Nguyen Thi Thanh, known as Saigon Lunch Lady, was being joked by locals with how popular she is every time a foreigner arrives and looks for a seat. No menu was offered yet a hefty bowl of soup with veggies on the side appeared in front of me. I had no idea about the soup but the only thing I know is that I slurped everything in the bowl. When I returned to the hostel and had a chance to talk to the crew, I asked what’s the soup being offered by Saigon Lunch Lady. The hostel staff told me that her menu rotates everyday but soup is constant all throughout the week. Tuesdays are for Bun Moc, a soup from northern Vietnam with a lot of meaty toppings. The goodies include slices of pork, pork sausage, meat balls, and others I wasn’t able to identify. Of course don’t forget the usual herbs and spices that really bring the flavors all together. Here’s Saigon Lunch Lady’s soup schedule if you’re interested. From Mondays to Sundays; Bun Thai, Bun Moc, Ca Ri Ga, Bun Mam, Bun Bo Hue, Banh Canh Cua, and Bun Rieu, all bowls at 40000VND. 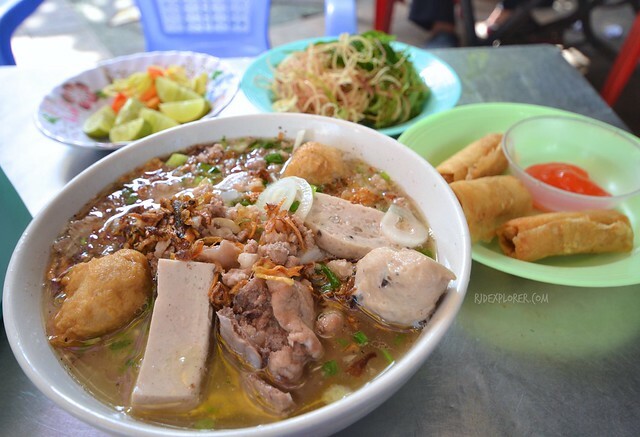 Aside from soups, Saigon has a lot to offer when it comes to streetfood and dining. If you’re a coffee lover like me, Vietnamese coffee will be your friend on your visit. You can avail one from the side-streets to a fancy café and one thing is for sure, taste is consistent. Cold version has a spoonful of condensed milk that sits on the bottom of a tall glass filled with ice. Coffee is served on a dripping Phin filter, your ticket to an exquisitely-brewed Vietnamese coffee. 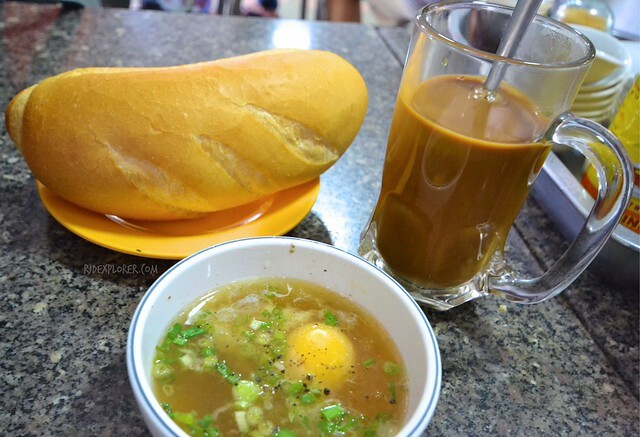 To pair with the Vietnamese coffee is the French bread baguette, a product of French colonialism in Vietnam, that is ubiquitous because of the Banh Mi sandwich. Banh Mi is filled with coriander, cucumber, pickled carrots, white radish, and sometimes with sliced pork, pork sausage, cheese, and pate. Lastly, spring rolls are also not-to-miss items when in Vietnam. You can have it fresh with vermicelli noodles, shrimp, and herbs and spices wrapped in thin and delicate rice wrappers. Other version is deep fried served with sweet and spicy dips. These items are only a fraction of all the possible Vietnamese food you can try during your visit. Visiting the city for 3 days is not enough to try the food wonders that this vibrant city offers. 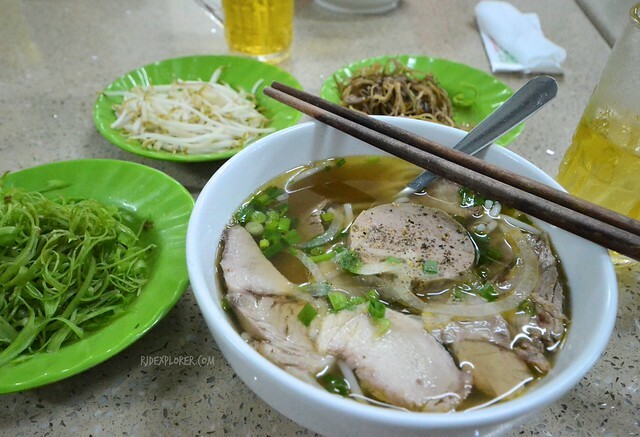 Any favorite food and a must-try in Saigon? Leave a comment below for other to try it when they make their way to Ho Chi Minh City. Hi Arjay! Your post is very interesting. I will be traveling to Vietnam this Monday alrease July 31. Do you have any names of restaurants where you tasted these food? I would like fo try them all! I am very for my visot to Vietnam. Hopefully you can help me. Hi Eva, I think most of these are random encounters on the streets of Saigon. Just list the food and find them while doing your walks in the city.